Hi, Obviously, the original suggestion that Police Constable 881 Edward Watkins blew his Police whistle at Mitre Square to raise the alarm of Catherine Eddowes murder, originated from the press sketches in 1888 which appear to show him doing such a thing. I am surprised that the City of London Police were so far behind the Metropolitan Police in the use of Police whistles. Joseph Hudson of Birmingham supplied the Metropolitan Police with 21,000 whistles in 1884. That is also probably why George Morris, a retired Metropolitan Policeman, still retained a Police whistle or obtained one by another means. I do seem to remember something which quoted PC 881 Edward Watkins as saying he had not given the 'general alarm' at Mitre Square and this obviously was because he had requested George Morris to take on this task and get additional assistance. The information probably came from the Catherine Eddowes inquest. I think it is reasonable to say that PC 881 Edward Watkins also did not raise any alarm using a rattle because he had already designated the duty of raising the alarm and getting addition assistance to George Morris and also because there are no accounts of PC Watkins doing such a thing. I believe it was well known that whistles could be heard from a distance of a 1,000 yards [900m] so it is slightly confusing why the City of London Police did not take up this new means of summoning assistance sooner. I also seem to remember reading somewhere that individuals of substance ie money ….....would often carry whistles for their personal protection. Alan. Hi, Here we have a nice original newspaper archive photograph from 1987. The stamp states, 'The Daily Telegraph published - 3 Oct 1987.' Obviously, they reproduced this section of the sketch showing Police Constable 881 Watkins signalling for assistance, in Mitre Square. The larger original sketch would have been created so that the newspaper readers could get an idea or feel for the events on that fateful night. [Jack the Ripper and the murder of Catherine Eddowes] This sketch therefore does not really need to closely resemble Police Constable Watkins physical appearance because the person, place and situation are all indicated in the sketch scene. Actually, I have just noticed that the sketch appears to show Police Constable Watkins about to blow his whistle for assistance. I am not a Ripperologist but I am sure it was only the night watchman George Morris [Met. Police pensioner] that did that. I don't remember any suggestions that Watkins blew his whistle? Alan. Hi, Just a brief summary :- It says in the book, 'John Christie enlisted as a Private in the Nottinghamshire and Derbyshire Regiment, number 106733, on the 19th of September in 1916, nearly seventeen and a half years old. He was entered into the reserve and not mobilised until the 12th of April in 1917. He was picked to serve as a Signaller. On the 2nd of April in 1918 Private Christie was sent to France and later injured by the blast of a mustard gas shell and demobilised on the 22nd of October in 1919. That must mean he could not have got the WW1 trio? Alan. Hi, Thanks for pointing out the difference between 'War Reserve Police' and 'Special Constables' as I did not know that. During the Second World War it must have been very difficult to check/search the records for individuals whilst London was being bombed and also having a desperate need for officers especially with so many men off serving in the forces. Although I have never read the ''John Christie'' story, I knew I had a copy somewhere in the house. Eventually I found it...……. ''John Christie of Rillington Place by Jonathan Oates.'' Interestingly in 1953, Detective Percy Law is now Detective Chief Inspector Law within the Photographic branch of the C.I.D. at Scotland Yard. He presented the photographic evidence to the Judge and jury during the early stages of the trial. ''''One of the Police Officers recalled, 'over the years I have seen some shocking sights but never one so un-nerving as that which greeted ourselves. It should be stated that the alcove [kitchen] containing the three bodies was packed indeed, as it only measured 4 feet high and was five feet and six inches deep. Yet there was worse to come...……….'''' Alan. Hi and thanks for putting in the link. Unfortunately, I never realised that Charles and Percy Law, who were both Inspectors at Scotland Yard and served there during the same period..... were related. I missed that link. I do not have any of the original research any more but some of the details are extremely interesting . Detective Inspector Percy Law [Scotland Yard, C.I.D. Photographic Branch] is quite famous because he was involved in one of the most famous serial killer cases in British history in 1953. When John Christie left his flat at 10 Rillington Place in Notting Hill, he left behind his wife's body under the front room floor-boards, three bodies hidden behind an alcove in the kitchen and then for good measure, two more bodies buried in the garden. I believe I read somewhere he served as 'special constable' during the war in London I have never read the full story but you would have thought the smell in the flat would have become unbearable. It was Detective Inspector Percy Law that took the photographic evidence which was presented to the court in the trial of John Christie. That photographic portfolio would be part of the trial records and I would guess it might be available from the National Archives because the trial records were opened to the public in 2002. I used the 'British Newspaper Archives' searching under John Christie or Rillington Place, until I found an article that gave his full name as Inspector Percy Law, most of the articles just stated Inspector Law. If you search the internet you will find copies of the original black and white crime scene photographs somewhere. It must have been horrendous photographing the bodies within that dark and shabby and run down ground floor flat. Alan. Hi, It is getting a bit late at night here but it is a good time to post this information to you in Australia. Go onto 'Ebay' and then 'Scotland Yard' and then 'paper and ephemera' and you fill find part of an article which has a picture of 'Detective Inspector Law of Scotland Yard's Photographic section. It is only £2.00 and they post worldwide. I believe it comes from and 1950's articles on the scientific aspects of Scotland Yard. The newspaper clipping will probably be only a few inches in size but you will probably never see another example. regards, Alan. Hi, Part 2. 'Comparing two City of London Police Constables - Police Constable 881 Edward Watkins and Police Constable 492 Henry Webb - that rejoined for Queen Victoria's Jubilee in 1897,' I believe that the City of London Police and the Metropolitan Police would have had a set criteria for the rejoining of ex-Police personnel for duties relating to the Queen Victoria's Jubilee for 1887 and 1897. It certainly would not have been done on an ad hoc or unprofessional way. For the purposes of this comparison, I will concentrate on the Queen Victoria Jubilee of 1897. For the purposes of this comparison, I will concentrate on the City of London Police criteria for the rejoining of ex-Police personnel for duties relating to the Queen Victoria's Jubilee for 1897. Queen Victoria 's Jubilee in 1897 would have been one of the biggest events that London has ever seen. This historic event was on a huge scale but the City of London Police did have previous experience from Queen Victoria's Jubilee from 1887 regarding how to organize and manage such an event. For the Queen Victoria Jubilee in 1887, the City of London Police issued 900 Queen Victoria City of London Police Jubilee medals to its personnel. By 1897, naturally the establishment of the City of London Police would have increased over the previous decade. 'The City of London Police awarded the following number of medals and clasps to their personnel in 1897.' [a] 535 Queen Victoria City of London Police medals for 1897 were awarded. 485 Queen Victoria Police Clasps for 1897 were awarded. 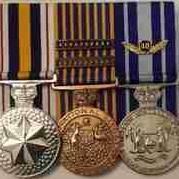 [These 1897 clasps were then attached to their original 1887 Jubilee medals which had previously been awarded.] [c] This means a total of 1,020 Queen Victoria City of London medals and clasps for 1897 were awarded. I can find no data that gives an exact number of ex-City of London Police personnel that were selected to rejoin but I would suspect it would be in the double digit figure range. Where that figure would be found ie lower or middle or higher double digit range, would require additional information. If we knew the establishment figure for the City of London Police in 1897 or around that date, we could then determine with greater accuracy the number of additional City of London Policemen that rejoined to man this historic event. The criteria used for the City of London Police may have been more specific and rigid than the criteria used for the Metropolitan Police because while the City of London Police rejoining numbers were much smaller, the Metropolitan Police numbers rejoining were in the high hundreds level. The 'Update of information on Pensioners who rejoined the Metropolitan Police for the 1897 Jubilee by J. H. F. Kemp,' records over 800 plus individual Police pensioners who rejoined the Metropolitan Police in 1897. 'Therefore we have PC 881 Edward Watkins and PC 492 Henry Webb that were both selected to rejoin the City of London Police for Queen Victoria's Jubilee Parade in 1897. What basic facts can be deduced from their circumstances that might help to indicate this criteria for rejoining the City of London Police.' [a] Both Edward Watkins and Henry Webb had completed their pensionable engagements with the City of London Police and were now City of London Pensioners. Both Edward Watkins and Henry Webb were considered to be first class Police Constables. [Statements given at the time of the Catherine Eddowes murder in Mitre Square etc clearly indicate the PC 881 Edward Watkins was considered to be a good and reliable Police Constable. Henry Webb actually rejoined at the age of 63 which is clear evidence that the City of London Police must have considered him to be a good and reliable Police Constable. It should also be remembered that Henry Webb had also served Queen and Country in the Royal Navy for 6 years, prior to joining the City of London Police. One huge reason for the selection of Edward Watkins for these duties, was that he was one of the most famous City of London Police Constables. His story and connection with the murder of Catherine Eddowes, at the time of the murder and at the time of the inquest, was published in every newspaper and even included sketches of him in uniform. I believe this fame would have placed him at the top of any list of rejoining City of London Police Constables.] [c] Both Edward Watkins and Henry Webb had participated in Queen Victoria's Jubilee Parade in 1887 and therefore they had first hand experience on what the City of London Police duties would be during this historic event. [d] Both Edward Watkins and Henry Webb were residing in London and were therefore available to take on these City of London Police Jubilee duties. [e] Both Edward Watkins and Henry Webb would have been required to be both fit and well and in general good health. Hopefully I have not made too many mistakes as I am not the greatest typist. regards, Alan. My apologies I don't quite understand why the bold lettering keeps jumping in or why the lists ie [a] etc keep getting messed up, as when I am writing the reply on my computer, everything looks fine. Alan. Hi, Part 1...…..This medal is a City of London Police Jubilee medal for 1887 and with the 1897 clasp and was awarded to ''PC 492 Henry Webb.'' I will give you all his details in this entry but in Part 2...….. I will compare this individual to PC 881 Edward Watkins in a specific way but that will have to be done later. Police Constable 492 Henry Webb. City of London Police. Henry Webb was born in Sunninghill, in Berkshire, in 1834. Henry Webb served in the Royal Navy for approximately 8 years, from 1857/1858 to January of 1866 and this explains why at 31 , he was an older recruit than normal , on joining the City of London Police. On the 8th of February in 1866 Henry Webb became Police Constable 492 Henry Webb, warrant number 3868 and was assigned to the 3rd division. PC Henry Webb [City Policeman 492] gave evidence at the Old Bailey trial of James Knight and Charles Chandler who were charged with coining offences, on the 4th of April in 1870. PC 492 Henry Webb gave evidence relating to their previous convictions and both men were convicted and sentenced to 5 years penal servitude. PC Henry Webb [City Policeman 492] gave evidence at the Old Bailey trial of William Williams  who was charged with simple larceny, on the 9th of January in 1871. William Williams was accused of stealing a half chest of tea from a wagon at New Bridge Street, in Blackfriars. PC 492 Henry Webb arrested William Williams and gave evidence at the trial. The prisoner was found not guilty. PC Henry Webb [City Policeman 492] gave evidence at the Old Bailey trial of John McDonald  for robbery, on the 12th of January in 1874. The prisoner attempted to rob an individual of a bag which contained a number of diamonds. PC 492 Henry Webb arrested the prisoner outside the Blue Anchor Public House. The prisoner was found guilty and sentenced to 18 months imprisonment. It is interesting to note that the heaviest sentence passed down was for 'coinage offences.'' Maybe they considered this type of offence was the greatest danger to the economy or maybe the heavier sentence was due to having prior convictions In 1887, PC 492 Henry Webb was on duty for Queen Victoria's Jubilee Parade through London and was therefore awarded the Queen Victoria City of London Police Jubilee medal for 1887. In 1888, PC 492 Henry Webb walked the streets of the City of London during the famous investigation and hunt for Jack the Ripper. The City of London was obviously heavily involved in the investigation especially regarding the Catherine Eddowes murder, in Mitre Square. It is also interesting to note that PC 492 Henry Webb would have been an extremely experienced Police Constable and would have been 53 years old in 1888. On the 19th of May in 1892 PC 492 Henry Webb retired on pension from the City of London Police when he was 58 years & 2 months old. I would suspect that it was quite an achievement for a Police Constable to still be pounding the beat at his age and therefore he must have been quite fit and in good health. I am sure he must have gained a great deal of respect from his colleagues, that he managed to complete his 26 years of pensionable engagement. From his person record which survived, we know that in 1892 he was five feet and ten and a half inches tall, had a fresh complexion, dark brown hair and grey eyes. Henry Webb also had visible tattoo's on both his arms. Henry Webb's retirement was only 4 years before the retirement of Edward Watkins. In 1897, Henry Webb was recalled to duty with the City of London Police for Queen Victoria's Jubilee Parade through London in 1897 and was therefore awarded the Queen Victoria City of London Police Jubilee Clasp. Henry Webb at this point is now 63 years old. I would suggest that he was recalled to duty because of his excellent record and for no other reason. It is interesting to note that some ''City of London Police personal files'' do survive but others like Inspector George Izzard or Chief Inspector James Izzard do not. Even where a file does exist, you cannot confirm that it is complete because they do not seem to ever come with any index of their contents. The personal file also vary considerably in size ie Edward Watkins with approximately 13 pages [13 single sides of information] and Henry Webb only having 5 pages. [5 single sides of information] and that is just two examples. Hi, In May of 2018, I purchased a Metropolitan Police Coronation medal for 1911 on ebay which I considered to be very interesting and was surprised by the lack of interest in the medal. The Metropolitan Police Coronation medal for 1911 was awarded to, 'PC A Phelps.' Now at this point, don't get mixed up with the City of London Police Sergeant William Henry Phelps who along with City of London Police Inspector George Izzard was involved in crowd control and public safety at the murder scene of Catherine Eddowes, at Mitre Square, in 1888. Alfred Robert Phelps was born in Mitcham, in Surrey, in 1888 and so was only a baby during the Jack the Ripper murders. Alfred Robert Phelps parents were Ambrose and Christiana Phelps. Ambrose Robert Phelps was born in Monmouthshire, in Wales, in 1858. On the 20th of August in 1885, Ambrose R Phelps married Christiana Mason, in Lambeth. It is recorded on the marriage certificate that Ambrose Phelps was employed as a Police Constable and his father was John Phelps. Police Constable Ambrose Robert Phelps joined the Metropolitan Police on the 28th of February in 1881 and was assigned to Wandsworth or 'V' division and given the warrant number of 65328. Police Constable Ambrose R Phelps was awarded the Queen Victoria Metropolitan Police Jubilee medal for 1887 whilst serving with Clapham or 'W' division. Police Constable Ambrose R Phelps served in the Metropolitan Police during investigation and the hunt Jack the Ripper. In the England Census of 1891, Police Constable Ambrose R Phelps and his wife Christiana Phelps and their two children Alfred R Phelps aged 3 and Ada G Phelps aged 1 are residing in the family home at 17 Tree Grove, Court Yard, in Eltham, in Greenwich. On the 6th of August in 1894, Police Constable Ambrose R Phelps at the age only 36 dies whilst he was serving with Greenwich or 'R' division. Sadly, he was leaving a widow and two young children, without their husband/father. The burial took place at Saint John the Baptist, in Eltham, in Greenwich. I am sure the Phelps family would have pulled together for this sad event and it would have been interesting to know who attended the funeral. One person I am sure would have attended was Ambrose's older brother and he was 'City of London Police Sergeant William Henry Phelps,' Yes, this is the same City Policeman who was responsible for the crowd control and public safety at Mitre Square . [William Henry Phelps born in Monmouthshire, in Wales, in 1851 and those parents were John and Mary Phelps]. So you see the Phelps family service with the London Police comes with a famous connection to the City of London Police but also has a family connection to the Metropolitan Police. Ambrose Robert Phelps never knew his son would join the Metropolitan Police but on the 1st of November in 1909, Alfred Robert Phelps joins Bow or 'K' division and is given the warrant number of 97434. Police Constable Alfred Robert Phelps was awarded the Metropolitan Police Coronation medal for 1911. On the 5th of November in 1934, Police Constable Alfred Robert Phelps retired on pension from the Metropolitan Police and Southwark or 'M' division. Alfred Robert Phelps later rejoins the Metropolitan Police and Southwark or 'M' division for service during the 2nd World War. It can be a small world at times, brother, uncle and nephew. Here is some more information on the Izzard family:- 'Chief Inspector James Alfred Izzard of the City of London Police.' James Alfred Izzard joins the City of London Police on the 27th of August in 1874 and was issued with the police number of 4289 and is also the nephew of Inspector George Izzard. Inspector George Izzard became famous for being in charge and responsible for the crowd control and public safety, at the incident involving the murder of Catherine Eddowes, in Mitre Square. James Alfred Izzard's daughter 'Lilly Louisa Izzard' also marries Police Constable [City 408] William Theodore Males and there are other Izzard family connections to the City of London Police. Unfortunately, the City of London Police personal file for Chief Inspector James Alfred Izzard has not survived. During the Jack the Ripper reign of terror in 1888, Inspector James Alfred Izzard appears to be stationed at Seething Lane Police Station, 54/55/56 Great Tower Street whilst his uncle Inspector George Izzard was stationed at the Bishopsgate Police Station. In the England Census of 1891, Inspector James Alfred Izzard is recorded as lodging at the Seething Lane Police Station while his wife and children are away visiting their parents/grandparents etc in Hertfordshire. In 1894, James Alfred Izzard and family are residing in a dwelling house at 36-39 Bishopsgate Street. On the 23rd of March in 1895, there is an article in the newspapers of an extraordinary explosion that took place at Fenchurch Street Railway Station where an elderly man was literally blown to pieces. He was a gardener to a Plaistow doctor and had been sent to a Fleet Street opticians to collect some sides and an oxygen cylinder for a magic show that was being put on. Whilst sitting on a seat, on the platform, he accidentally dropped the oxygen cylinder and the resulting explosion was so powerful that people thought that a railway locomotive engine boiler had exploded. Chief Inspector Izzard took charge of the incident and body parts were placed in a couple of hampers, until a shell from the local City Mortuary arrived. On the 9th of September in 1895, there is an article in the newspapers regarding 'a bomb' in London. A suspicious device was found in Mincing Lane which had previously been run over by a sewer cart and was believed to be a bomb. Chief Inspector Izzard who is the inspector appointed by the City of London under the Explosives Act was immediately called to the incident. The device was placed in water to make it safe and was eventually sent to the Home Office Inspector of Explosives who declared the device harmless. In 1897, James Alfred Izzard and family are residing in a dwelling house at 36-39 Bishopsgate Street. Chief Inspector James Alfred Izzard was heavily involved in the City of London Police cricket team and other City of London Police sporting events which can be evidenced by a newspaper article in 1897 which reported on one such event. In 1900, James Alfred Izzard and family are residing in a dwelling house at 36-39 Bishopsgate Street. On the 19th of July in 1900, Chief Inspector James Alfred Izzard retires from the City of London Police and is awarded a pension of £146.3s.3d. On the 9th of January in 1901, at the Bishopsgate Institute ex-Chief Inspector James Alfred Izzard was presented with an address and cheques for 200 guineas on his retirement from the City of London Police. On the platform were many distinguished guests and there was a great deal of praise for his service to the City of London Police. In the England Census of 1901, we find that James Alfred Izzard is recorded as being a 'Police Pensioner' and the family are residing at City Cottage, 129 Rabley Heath, in Codicote, in Hertfordshire. In the England Census of 1911, we find that James Alfred Izzard is recorded as being a 'Police Pensioner' and the family are residing at City Cottage, Rabley Heath, in Codicote, in the Parish of Welwyn, in Hertfordshire. In 1926, James Alfred Izzard dies at City Cottage Rabley Heath, in Hertfordshire. 'Police Constable [City 251] George Izzard, Old Bailey trial attendance, in 1864.' On the 17th of May in 1864, John Elvery  stole a 7 yard roll of cloth from a tailors shop and he was then chased and caught by the shopman in Charles Street, in Hattongarden. Metropolitan Police Constable [G210] William Taylor then took charge of the prisoner. Police Constable [City 251] George Izzard also came to the assistance of Police Constable [G210] William Taylor. At the Old Bailey trial of John Elvery, the prisoner was found guilty of the charge. A previous conviction in 1854 regarding a felony charge which resulted in John Elvery receiving a 4 year sentence was also highlighted to the court. For the theft of the roll of cloth, John Elvery was sentenced to 5 years penal servitude. What is interesting and nice about the case, is the co-operation between the Police Constables of the City of London Police and the Metropolitan Police. They worked together to ensure the conviction of the prisoner. The sentence appears to be quite considerable for a rather inept and poorly thought out attempted theft but we must remember this incident occurred in 1864. The case also highlights why prisoners would use any means necessary, including alias names, to prevent their previous convictions from being identified. Repeat offenders, even if their previous conviction was over a decade old, could often expect little sympathy from the judge and court. Another small insight to George Izzard. Hi, Just a quick update:- 'Inspector George Izzard is the uncle of Inspector/Chief Inspector James Alfred Izzard who is his nephew.' Family history of the Izzard's. John Izzard [1809-1852] and Sarah Izzard [nee Pratt 1806-1888.]. Their son is George Izzard [1842-1901, born in Welwyn, Hertfordshire in 1842.]. Later to become City Inspector George Izzard. Their daughter is Elizabeth [Betsey] Izzard [1837-1891, born in Welwyn in 1837]. Older sister of George Izzard. In 1854, in Welwyn, Hertfordshire, Elizabeth [Betsey] Izzard gives birth to ''James Alfred Izzard'' without marrying and the family relationship of uncle and nephew is created. A family tree on Ancestry was of great assistance. All I need now is to confirm which of the two Inspector Izzard's was in charge of crowd control at the Catherine Eddowes murder/Mitre Square Incident. I believe it was most likely Inspector George Izzard but hopefully this can be confirmed one way or another. Alan.